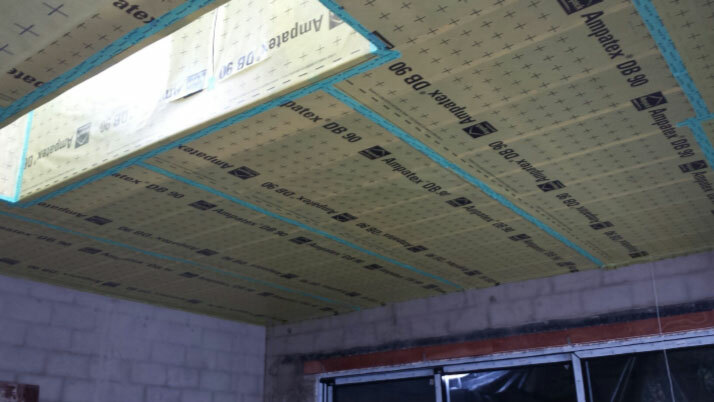 To ensure an airtight seal on timber elements such as roofs & timber frame walls we use an airtight membrane. There are 2 main reasons for creating this airtight seal. Airtight membranes prevent air leakage but will allow water vapour to pass through in a controlled way. This will allow the building to ‘breath’ without affecting the airtightness. By breathability we are referring to the ability for water vapour to pass through the structure without condensing & causing harm. This water vapour is in the air around us & increases in our homes especially in wet areas like bathrooms & kitchens. The type of membrane used will differ on the structure and the level of breathability required, so flat roofs will generally require a membrane with different vapour resistance than an external wall or dormer roof. In some structures it may be required to use intelligent membranes which vary their ‘breathability’ depending on the conditions. They may also allow water vapour to pass back into the building when required.